The Ratkowski Foundation has been at it again. Their agents have scoured the online bazaars for any items that even faintly smell like Maplewood. The mixed bag they have turned up this time holds some interesting stuff. These fascinating pieces of flotsam that have been orbiting Maplewood in cyberspace are like satellites that have just returned to the their launch pad. As always, these items will be gifted to the Maplewood Public Library for inclusion in their stellar collection of historic Maplewood artifacts. But before we release them to their new custodians, Dawn, Sam or Barb at the MPL, let’s have a look at them. 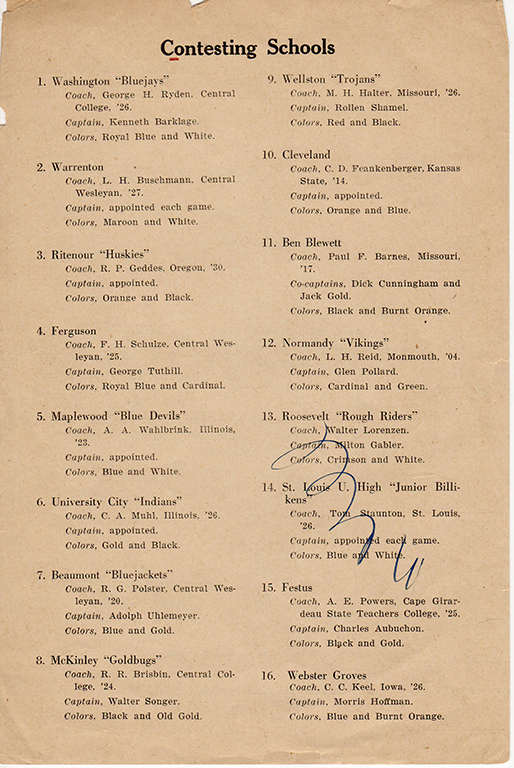 1933 must have been a good year for basketball teams is all I can think to say. That’s a handsome group! Well, except for a few of those knees. Look like mine. Here’s the flip side of that basketball sheet. 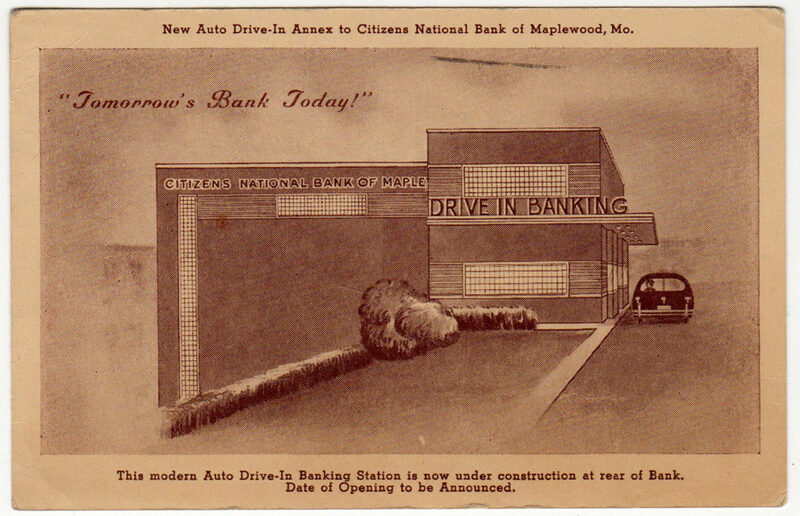 I think I remember reading that the myth builders working at the bank during this time have this as the first drive-in banking facility west of the Mississippi. Probably not counting LA and San Francisco. This is a joke. 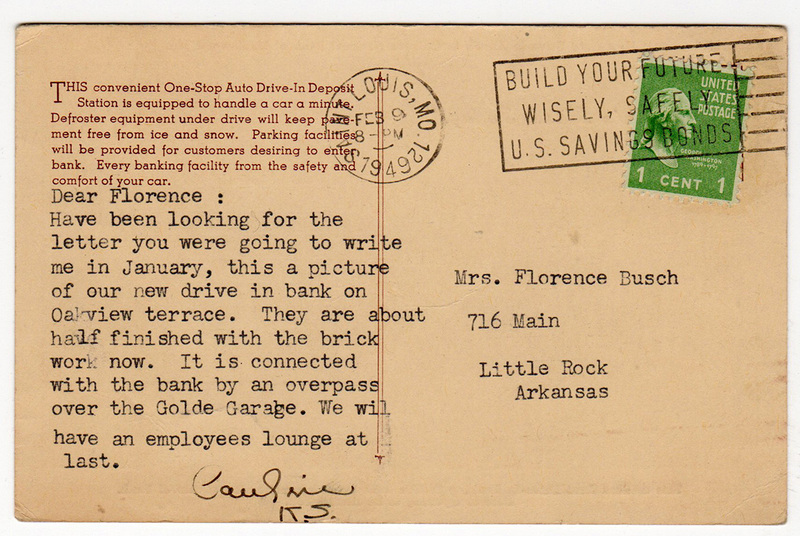 The flip side of the bank postcard. That’s the year I was born in. And the city but not the month. Now this is cool. I love these. One has to wonder how these postcards of a single residence came to be. Perhaps the owners of the property called out the photographer and ordered 5 or 10. If they ordered much more than that you would think I’d have at least a couple of examples of the same image. Someday I’ll have to round up all of these in my archive. I don’t think I have ever seen more than one example of each. Can anyone figure out where this home is/was located? I’d bet it still exists. “… a visit from you all. I will try to be in to see you all…” Two “you alls” in three sentences. It is music to my ears. Augusta has to be from the same place my family comes from… Texas. Someone show this to our resident Scout impresario, George McCandliss, also 1/2 of the proprietorship at the Scheidt True Value Hardware Store at 7320 Manchester in business continuously since 1907, same location since 1916, used to be a theater. If you haven’t been there shame on you. If you haven’t been there in awhile, why not? George, and Ben Reynolds, the other half of the proprietorship, have everything you could want in tools, hardware, general home maintenance items, camping supplies (I said he’s a scout) and a lot of other cool stuff as well. All great quality. You’ve really got to see it to believe how very wide a range of inventory they have cleverly folded neatly into the historic interior of their store. On top of that, they are preserving one of our most important historic commercial buildings. So get in there and buy everything you possibly can from them. They are our Mom and Pop hardware store. Almost nobody else has one anymore. We have to support them. 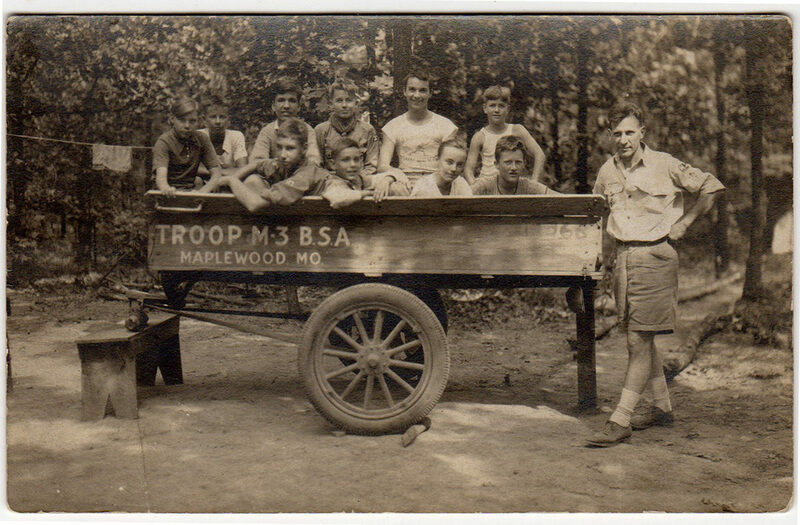 The flip side of the scout postcard. George, I can give you a high resolution version of the other side of this if you want one. These tags are not part of the recent Ratkowski haul. This image was sent to me awhile back by probably the foremost collector of Maplewoodiana whose name should be familiar to followers of this space, Martin Fischer. Mr. Fischer contributed nearly all of the images and information that I posted concerning Kalb Electric, if you remember those. He has contributed so much in the past that there is no way I could possibly remember it all. 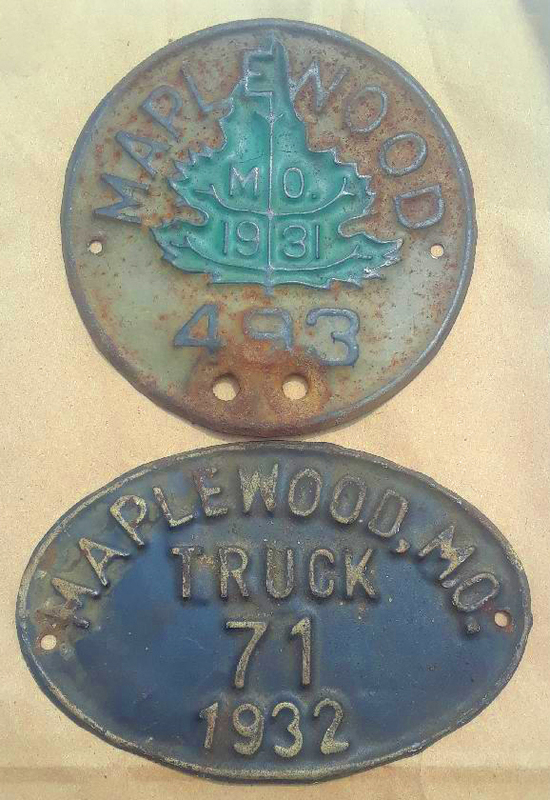 I don’t have much information concerning these metal vehicle tags. Perhaps a reader can fill us it? The top one looks like a Christmas tree which is appropriate to the season. We are indebted to the Ratkowski Foundation and to Martin Fischer for sharing these items and images with all of us. Together they all help us to increase our understanding of our shared past. I so enjoy the rigorous coverage of Maplewood history that 40 south supports. Thanks to Mr. Houser for his continued digging and preservation. For years, though, I’ve been yearning, as a Richmond Heights resident, to learn more about my own city. Can’t we clone Mr. Houser or find a similar enthusiast to contribute to 40 South to give some coverage to another historic gem? Our city doesn’t have the same “center” feel that Maplewood does, I think, primarily because it’s split into multiple school districts, and that splits the community. But the really historic residences and other buildings merit more public attention as I’m sure you agree. Stacey, you have a superb historian in Richmond Heights. Her name is Joellen McDonald. She is a good friend of mine and is an author of your historic Richmond Heights book. I don’t think she’ll mind me giving you her email address. It’s jgmcdona@sbcglobal.net. Your idea to clone me is intriguing. I’m afraid there are numerous folks who feel that one is more than enough. Thanks for putting forth your idea. I got a laugh from it. 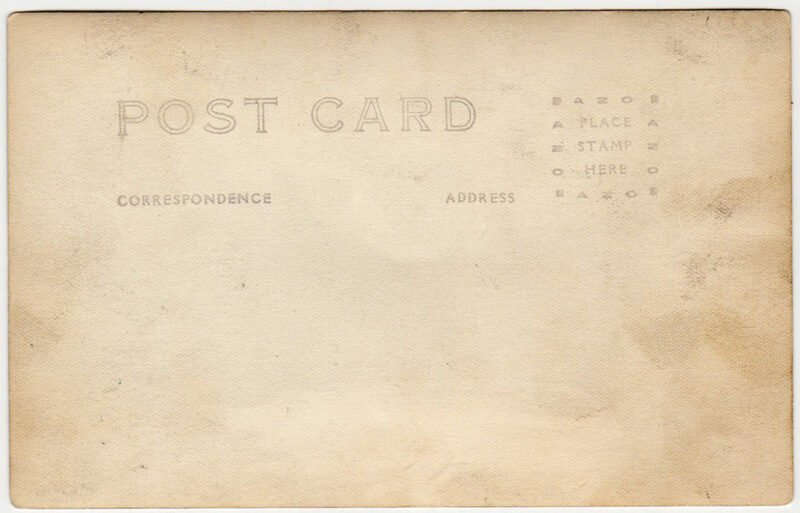 I would very much appreciate a copy of the post card. Does anybody have a guess as to a possible date? I did send George a high resolution copy of that Scout image. So far no one has hazarded a guess as to the date. Sorry, George. On the post cards, I seem to recall seeing a 5 or 10 piece set that you could buy at places like a gift shop or maybe at city hall. The set was what I would consider an advertising for the town showing off what the homes looked like, maybe a couple of downtown stores, the schools and some of the activities that could be done if you moved to Maplewood. Then there might be some individual cards that you could buy if you did not want the entire set. Remember the deck of cards I showed you from St Joseph Mo. That was a set used to show the area architecture and such and I would consider it the same type of advertising. I think you need to revive the postcards of our current buildings before we lose any more. Hi Mark, I have many reproductions of these post cards such as you mention. It is easy to understand why a photographer might speculate by taking images of the main drag or scenes that were easily recognizable to persons familiar with the territory. Mail was delivered twice a day. The postcards were then what our texting is now. A person needed pretty many postcards to communicate. With a recognizable scene the photographer could count on having many different customers. The part that I don’t quite understand is the postcards that feature a single family residence like the one in this post. Do you think the property owner arranged to have them made? Wouldn’t that have been too expensive for such a trivial task? If 50 or so were printed at once then I would expect to have had more turn up in my scavenging. As it is (I believe this is true) the most I have ever found of any of them is a single example. Curious. I believe that fairly often more than one copy was made of ordinary photographs. I have seen two copies of the interior of the Sutton Mansion. I have found two copies of Dr. Cape’s home with people on the front porch, for example. Somewhere out there must be an advertisement placed by a photographer offering to turn an image of your home into postcards. I guess. Thanks for your comments. I always appreciate them. Doug, I agree that you would think that there would be more than one if they were for advertising. But remember they were also sent to other places I am thinking, not just to local people. So there may be one floating around at a distant relative that moved to Florida or wherever. Part of my wondering if they were advertising is the date of what looks like 1908. You can see another building but the one house is the focus. Maybe the builder had several made when he built the house and gave them to the new homeowners to use. They could be scattered all over the place. And as you know from your treasure trove of things who knows what is stored in someone’s attic or basement. Years ago I was at a home that took out about 6 dumpsters of “trash” out of a home in University City. I had a friend who was a stamp collector. I never looked at the fronts of the post cards, never read the letters but took him several bankers boxes full of post cards and letters and he collected a bunch of stamps off them. I am pretty sure he just tossed whatever he was not interested in although I never really asked him too much about it. 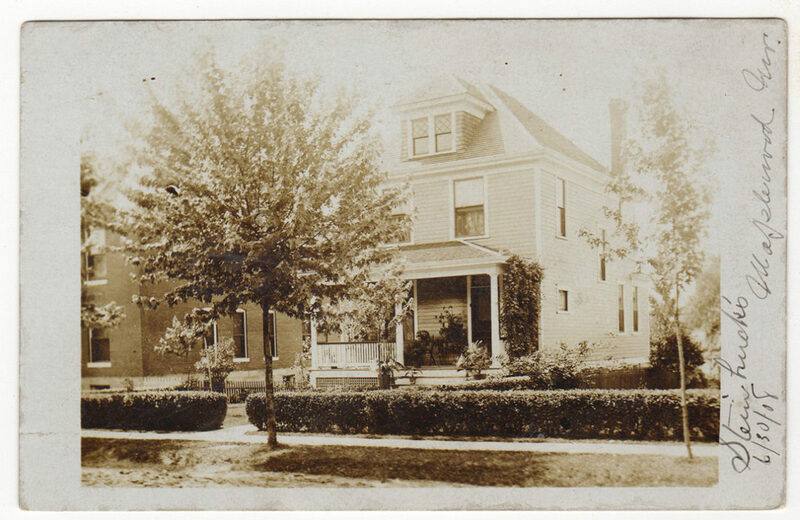 The house in the postcard is 7434 Hazel Ave. and was first owned by Ida Steinbrueck. 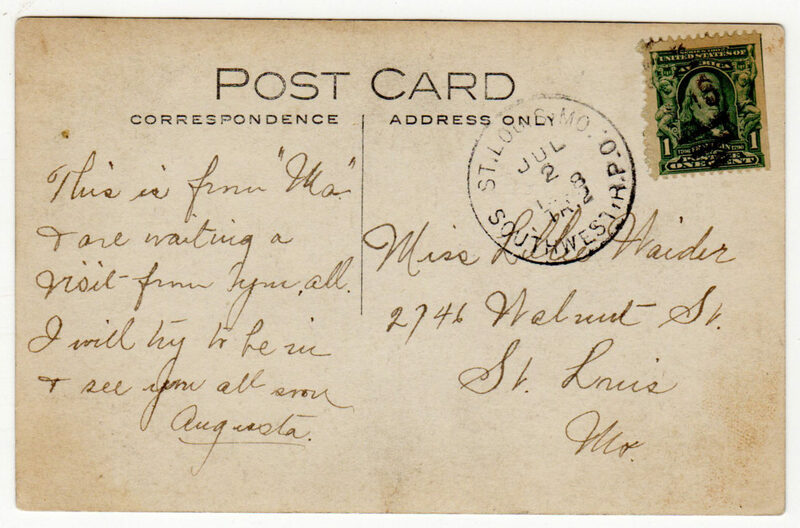 Ida’s younger sister Augusta is the author of the postcard. In 1910, these two women are the only listed occupants of the house. Ida was a public school teacher in Wellston and Augusta was a stenographer for a hardware business. In 1920, Ida’s niece Alma Fuchs, her husband Albert, and daughter Alberta are living with Ida in the house. Albert is listed as a salesman for a flour mill. Alma Fuchs is the daughter of Ida’s younger brother Otto. The Fuchs would be the next owners of 7434 Hazel Ave. after Ida passed away Sept. 15, 1925. Ida never married. The Steinbrueck parents, Fred and Charlotte, were both born in Germany and had four children, all were born in Missouri. Fred was shoemaker and lived at 2754 Manchester Ave. In 1930, 7434 Hazel Ave. is being rented by Joseph Stoddard, wife Bernice, daughter Audrey, and son Joseph. Joseph is listed as a monotype printmaker for a newspaper. The Fuchs family is living at 3440 Oxford Ave. in Maplewood with their three daughters and Albert’s widowed mother Margaret. Albert is working as a salesman for plumbing supplies. The Fuchs also owned 3440 Oxford. And both households have radio sets. In 1940, now a divorcee, Alma Fuchs is again found living at 7434 Hazel Ave. with her three daughters. Alma is still listed as the owner of the residence. Alma is working as a fitter for a retail Dept. Store and daughter Margery is working as a librarian. Dave P. Thanks for the info and identification of the house in the postcard! Dave, if I had a payroll you’d be on it. That’s fascinating stuff. I can’t get over how good you are at finding all this information. Thanks again. Happy New Year! Michele and Doug, it’s nice to know there are other people out there that enjoy the information gained from my quirky curiosity with old documents and skills with large databases. Happy to help and share when I can. I was just excited to see an old picture of a house I see daily! ps. Doug- I am getting your emails but can you check your gmail spam folder I think you may find a few emails I sent you in there. If you can’t find the spam folder (you may have to go into your gmail settings and select show the spam folder) or unflag me as spam I will contact you with a different email address. Dave, I could find nothing you had sent anywhere. Not in spam, junk or trash. Give it another try. Thanks. Dave – this is fantastic detail. Do you have anything similar for the next house over, 7438 Hazel? Also note: the back 2 windows on the west side of the house are longer in the picture than they are if you look at the house today. Recent work on the house shortened these two back windows. Hi Steve (and Nina), thanks for the gourmet Christmas candy canes. I do have some information on previous owners of your house. Though, the only thing I remember off the top of my head is in 1910 the first owner of 7438 Hazel was a fishmonger, heh. I never see that side of 7434 Hazel so didn’t realize the windows were shortened, I guess they did that to accommodate kitchen counters? In my household, we will probably always call 7434 Hazel the green rental but now that it’s not green maybe we will call it the Steinbrueck house. It was in desperate need of a rehab and the landlord spent what? nearly the last two years or more doing it? So we are thrilled that it’s done. Taking time out from wrapping presents to say thank you, and Merry Christmas to you! I hope you got all of those presents wrapped, Patty. I didn’t. You are welcome and Happy New Year to you and your family. I did get all the presents wrapped, but not all the ornaments up. Happy New Year to you, Doug, and thank you for all you do. I believe that house is on Flora. Merry Christmas to you and yours. Thank you for all the fascinating things you share with us all year. I am always forwarding or quoting your stories to friends and family. It also could be one of the houses on Marietta towards Sutton. Architecture is very similar there. Although my guess is, that same style of architecture is in many places throughout Maplewood. Check out Marietta on Google maps, street view. Good guess, Michele. Thanks for weighing in. You are welcome, Margaret. Thank you for sending my posts on to your friends. The more the merrier! You are welcome. Happy New Year, Pickett! I believe you are correct about the “tree”. 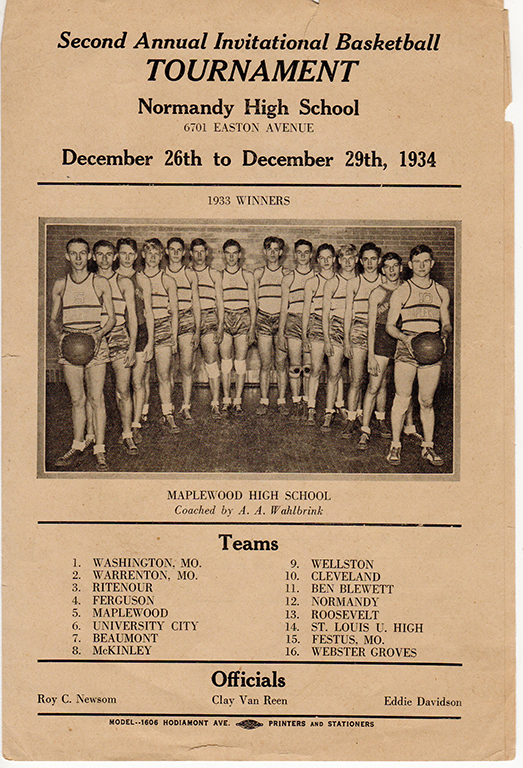 Doug, thank you so much for keeping Maplewood history alive! Merry Christmas and Happy New Year to you, too. You are welcome, John. Happy New Year to you as well. Good to hear from you.